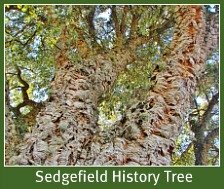 These are my personal childhood memories of Sedgefield -its early village life. 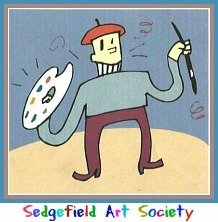 In the late Sixties, I recall that Sedgefield was indeed a hamlet. There was no doctor or dentist, no pharmacy or restaurant. There was no traffic light and very few stop streets. 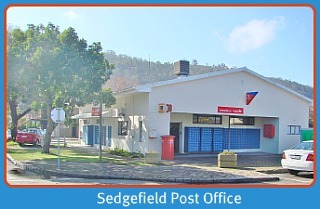 If one drove into Sedgefield from the George side, Kleyn's butchery was where the water and electricity department is now. 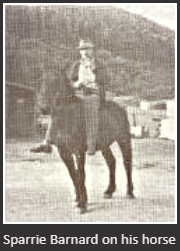 Fresh milk was available from Sparrie Barnard and horse riding for the more adventurous holidaymaker or foolhardy resident. 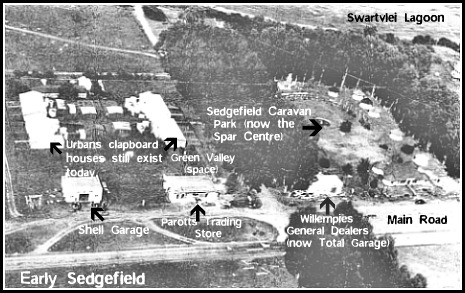 Just up from Sparries land was Dirkers house – 1 Sedgefield Main Road – and this was the place to go to if you needed your car or tractor serviced. 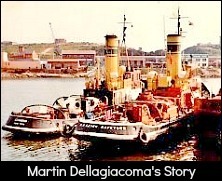 Memory recalls that it was a somewhat hazardous affair to get the vehicle where it should be, as one had to negotiate reversing onto two narrow strips over a pit with Dirker directing the procedure from the pit itself. Just up from Dirker was Tony Jablonski's accommodation. 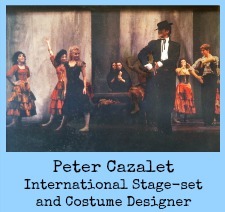 In the late Sixties it was known as "Polonia" and then became known as "Africa South" in the Seventies. 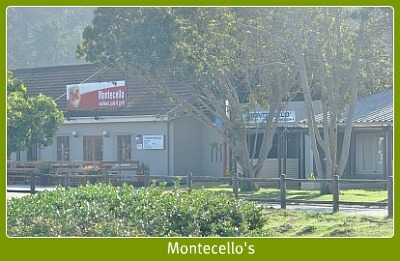 It has been Montecello since the late Eighties. Walter Muller owned Mullers Motel. It also had a tea garden and was situated where Forest Lodge is today. Many know about the monkey on the pole, but perhaps not so well known is the fact that Walter Muller sold newspapers from a lean to on the side of the cottage. This worked on an honesty system and apparently Walter claimed that in all the years he operated this way he was never short a cent - one of the great qualities of small village life! He always drove Buicks. At one stage he owned the original Karawater after Jack Robertson had sold it.He used to launch his fishing boat from the poles standing at Leeukoppie at Gerickes Point, on cart rails. 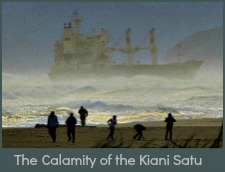 The boat was later washed away in heavy seas. 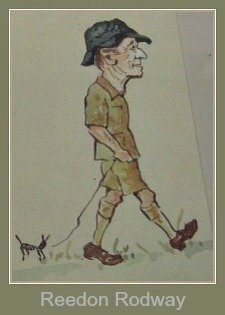 He was quite an athlete and once won a bet to run against a horse which had the bragging owner, Sparrie Barnard, eating humble pie! 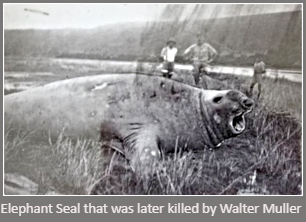 He also stepped up to cull an elephant seal that came into the lagoon in 1947. It terrified the locals so a meeting was held where a decision was made to kill it. The community however used every bit of meat and made candles and soap from the fat. 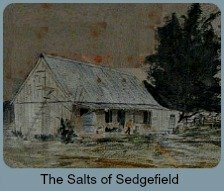 Walter lived at Sedgefield for many years before he moved to Buffelsbaai where his house was called Sopieshoogte. He also owned another one on the koppie. The Motel was later purchased by Sam Kerr and he called it Anchor Cafe. It still had rooms to rent. 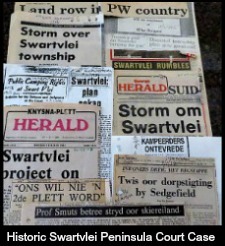 Around 1996 Hennie and Gloria Louw bought it and it had become a Supermarket. Much later, Gerry Stavros bought it when it was called Stop 'n Stay - accommodation and cafe/shop. He eventually revamped it completely so that it became know as the Forest Lodge complex that it still is today. 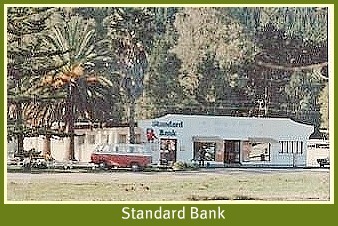 At one time The Standard bank hired a room in this complex and bank cashiers would come out from Knysna once a week to conduct business in Sedgefield. I have it on good repute, that, on one occasion the key to this room was mislaid and they were forced to conduct their business on the pavement! 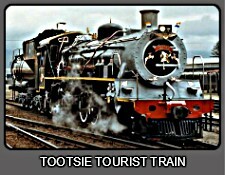 Behind "Stop n stay", was the station run by Ms Agnes Hart (a one-time headmistress in Sedgefield). 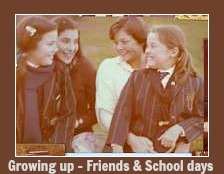 Here childhood memories are inadequate but I believe, for those who knew her, Ms Hart made quite an impression in her long skirts, gardening shoes and hats bigger than Panama. I also believe that she kept very strict hours and if you hadn't collected your goods by 10:30 of a morning you were forced to wait until the following day. Just in front of the station and opposite "Stop n Stay", was Punny Barnard (brother of Sparrie) who used to do paraffin fridge repairs. 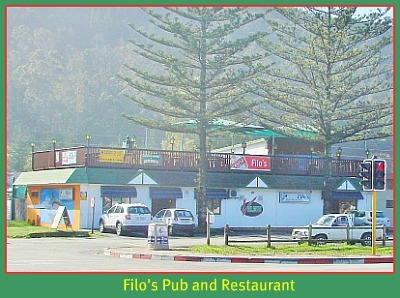 This was where Filo's is today. Parrotts Genral Dealers Store with the Post Office inside the shop. Crossing the road, Sedgefield Primary School had just moved from where the Post Office is now to its current position and Sedgefield Post Office moved from the fish shop opposite the Shell garage to its current position opposite Placid Waters. In the early days it had been run from a section of Mr Noel Parrott’s General Dealer’s store. Initially, Noel Parrott had been based at the Air Force Training School in George, having been trained by Armstrong Siddeley in the UK. However, he saw an opportunity and left to open his Sedgefield store. 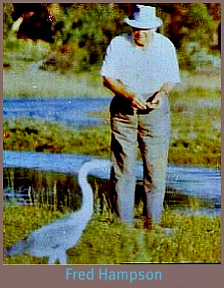 His wife Pauline Ballenden, was the daughter of Sidney Ballenden a forester who worked for the forestry department until he resigned in 1945. 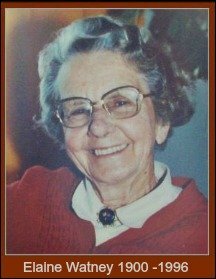 The first postmistress of the present day Post Office was Juliana Van Der Westhuizen. 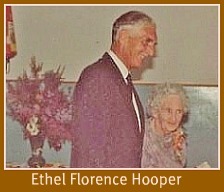 Her father was Clerk of the Works at the National Roads Dept. Juliana lived diagonally opposite the Post Office, a short way down the street. 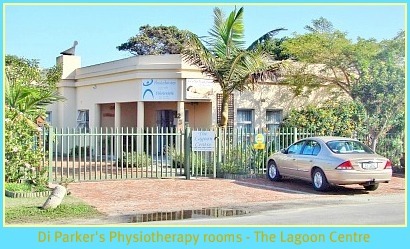 Her house was sold in 2003 and resold thereafter to become Di Parker’s Physiotherapy rooms. I remember that the Shell Garage used to be the only garage. At that time it consisted of three hand pumps. The main road ran directly in front of the garage where the access road is now. This garage was initially owned by Juliana Van Der Westhuizen's brother and then later, in the early to mid-70s, sold to Wesley and Barbara Sparks. In Jan 2009 Wesley sadly passed away in a car crash so his son, Ian runs it today. 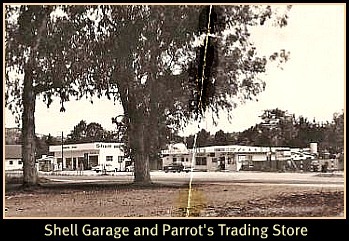 Next to the garage was Parrotts trading store. Parrot Street was named after Noel Parrott. Back then Green Valley was just a grassy field and behind that were Urbans' houses which are still there today. Pick 'n Pay centre (formerly the Spar Centre was first of all the Sedgefield Caravan Park and where the Total Garage now stands was a shop run by the Hockley family. This later became known as "Wilmpies" General Dealer. After that it became the Pharmacy until it moved to where it is now. 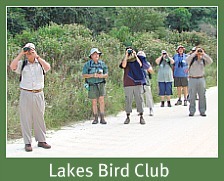 In fact, in the early Seventies, we children used to say that village life consisted solely of estate agencies and caravan parks – Lake Pleasant, Sedgefield Caravan Park, Cloverdale, MontMere, Pine Lake Marina, Paradise Park, Jooris, Swartvlei and sometime after that, Landfall and Trail’s End. There were a few houses in Swallow Street and approximately 15 to 16 white clapboard houses up towards the mouth culminating in Sydney Press's house overlooking the mouth. Coming back down Swallow Street, I recall Mrs Watney, a central figure of village life who left an enduring legacy to Sedgefield. Instrumental in the building of the St Francis Church opposite the school and Chairperson of the Village Management Board she also spear-headed the building of the library (this being the original wooden building where art exhibitions are held today). 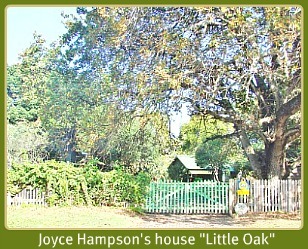 Her house in Flamingo Street she donated to Sedgefield and it became the basis of Sedgemeer Park Retirement Home that exists today. 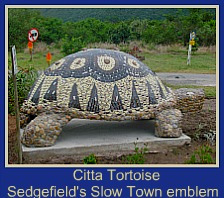 The Village Management Board ran local affairs long before Sedgefield had a Municipality. This was headed by a Mr Slabbert, with Joyce Hampson’s mother on the committee and my mother doing their typing. 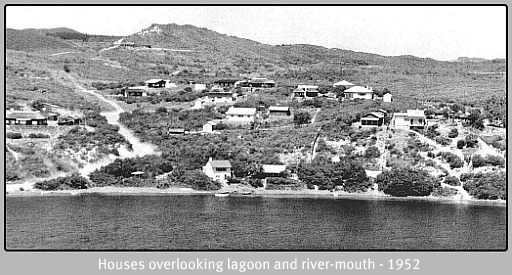 Opposite the library was Placid Waters where one could rent a rondavel in season or most any time of the year. Two ladies I remember fondly who used to stay here were Lady Gilfinnan, commonly known as Granny Gilfinnan, who favoured large hats and many cats. 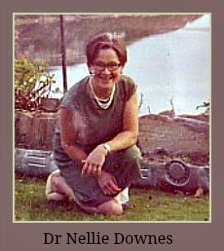 Rumour at the time was that she was forced to flee Uganda at the time of Idi Amin. Village life included Nora Atkinson (known to me as Mrs A) a specialist in all matters relating to boxer dogs. My sibling’s joke was that if one saw a long queue of traffic travelling through Sedgefield at 20 kilometres per hour, one could bet whatever one liked that heading that queue was Mrs A's Mini, wreathed in a cloud of cigarette smoke with a boxer dog or two slobbering profusely over the front seat! Next to Placid Waters was, and still is, the Hampson's house. On the other side of the Hampson’s was Germain Rouillard who was appointed first librarian by the Village Management Board. Her policy was, very strictly, "no children after 3:30pm". Because I spoke of Mrs A and her driving habits, I feel that mention must be made of Mrs Hooper who originally owned our property. 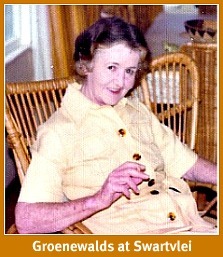 An vibrant character of village life, she was another person to watch out for in that stop signs did not exist for her. She would drive up to the national road from her house and swing out over the cattle grid as if it were a racetrack. When asked once why she never used her indicators, she replied: "Why should I? Everyone knows I live here!" Hence another one of our little sayings in the early 70s was: "Beware of little old ladies in big hats behind steering wheels" although there are a few retirees in Sedgefield with this affliction today! Amusing recollections of village life include Sedgefield's telephone exchange that operated on a party line. It was very much along the lines of that TV sitcom "Nommer asseblief". 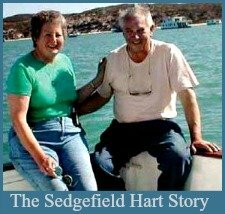 Our number was Sedgefield 28 and our ring was three longs and three shorts. 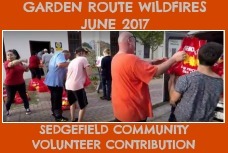 Now, some things in Sedgefield just haven't changed over the years and I'm referring directly to the fact that we have many hard-of-hearing residents in our village. You can well imagine that the daily telephone conversation would go something like this, "Lake Pleasant, good morning......Mrs XYZ get off the phone. Three longs and three shorts is not your number." One incident I remember quite clearly was Dad being stopped in the village by one of the party line constituents who said, "Mr Lidstone, I'm so glad to hear that your brother in Wales is on the mend now. For a while we were all so worried. But we've monitored his progress very closely over the last few months and we can see a vast improvement"! There are pros and cons to everything, not least of all, small village life!